Simply click HERE and search for a Dive Centre. Contact these centres directly and tell them you wish to appoint them as your appointed centre in order to complete the practical training! The rest is between you and the RAID Dive Centre. RAID is the world's fastest growing diver training agency with both full service RAID Regional Offices, dive stores and instructors waiting to provide diver services across the globe. RAID is also the first diver training agency to offer a complete range of online diver academic programs from beginner to instructor examiner levels in snorkelling, scuba, rebreather and freediving. Few companies become successful doing the same thing as everyone else. Leaders in every field look for an edge, something that will make them stand out in the crowd. Continually doing the same thing is insanity. That is, insanity is doing the same thing over and over and expecting a different result. So if you are doing the same thing over and over we believe it's time for a change. A new approach to how people learn to dive, how we retain divers and work in partnership to grow your business is what RAID is all about. RAID has taken a new, and we believe, a far better approach to diver training. It starts by ensuring we train great instructors and in so doing, we are literally rewriting diver training standards, and in so doing creating new benchmarks of excellence. For example, our minimum requirements and prerequisites to enter instructor training necessitates almost twice that compared to current industry standards. We feel this is essential to ensure divers in training are only exposed to highly skilled, truly experienced and extremely dedicated dive professionals. Put it this way, would you feel comfortable putting a loved one in the care of an instructor that may only have completed 100 dives and never dived below 20 meters / 66 feet themselves? Clearly not. This is why we also require all RAID instructors to have completed a Deep Diver and Nitrox Course as these are major interest areas for all divers and where unparalleled expertise and a state of the art approach to training is needed. To be a RAID instructor, or even a RAID entry level diver, your buoyancy control needs to be at the top of the skills list. While diving is a safe sport if you firstly gain proper training and follow the safety rules, the Divers Alert Network (DAN) statistics have revealed that dive accidents often reflect poor buoyancy control and therefore is a major risk factor in all forms of diving. This is why we at RAID put so much emphasis on great buoyancy control at every level of training. For example, the RAID Open Water 20 course covers buoyancy skills generally reserved for a separate specialty course with other training agencies, because we believe it is a prerequisite to ensure safe diving. Our online diver academic training system incorporates over 50 online courses. It is the most comprehensive and largest bank of online courses in the dive industry covering every level of training from snorkelling to high-tech rebreather diving. Like so many forms of higher education offered by colleges and universities, RAID acknowledges that the modern customer neither has the time or desire to sit in a classroom. Similarly, who wants to burn up holiday time in a classroom when you could be straight into the in-water sessions? So at RAID, our online courses allows the diver to progress through the diver academics at their own pace, anytime, anywhere. This approach also allows the RAID Instructor to spend more time in the water developing skills. We know some instructors and some students prefer more face to face interaction with their customers. 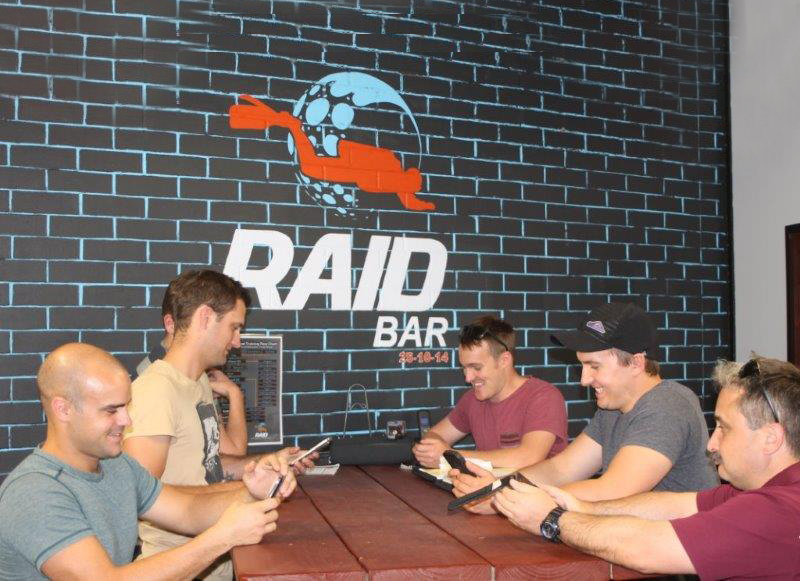 We have devised a creative way to achieve this, what we call a RAID Bar, you can put your own twist on this concept, but the idea is to create a simple relaxed area where customers can study online in store. Our ground breaking quality assurance program incorporates a globally acclaimed and fully integrated approach to ensure RAID Standards are maintained throughout all elements of all courses. As a RAID Dive Centre it gives you extra protection by giving you an advanced quality control system to help ensure quality training. At RAID we believe one of the best ways to support your business is with independently owned regional offices. While we focus on consistent, high quality training standards we believe it is critical regional offices have the autonomy to meet the needs of the local market. 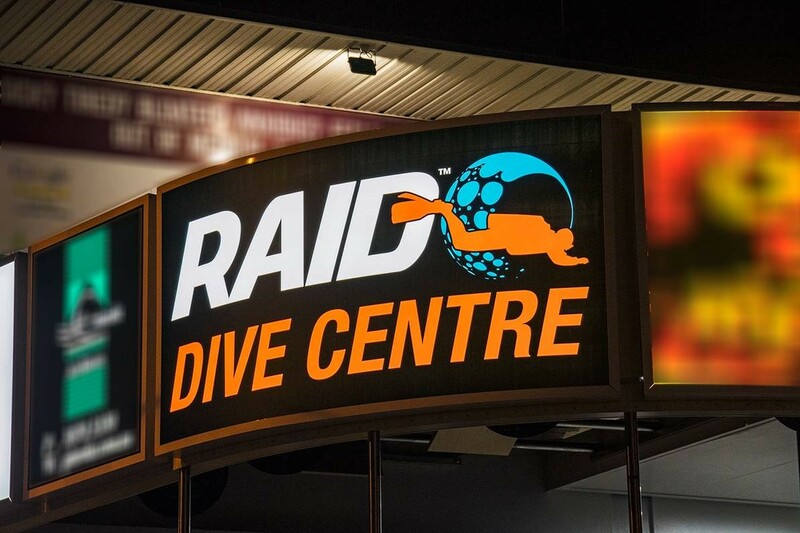 The shareholders of RAID and their senior executives have all owned and run dive stores. We are divers and fully committed to the industry and its growth. Similarly, we know the challenges and have developed many tools to meet those challenges. So do not expect to only see our representatives in your store when they want to sell you something. We realise your success is our success and offer support from the largest range of online training to business consultation. In brief we believe the key to success is not so much a revolution, but an understanding of and focus on, the fundamentals. 1. Re-positioning the brand: "Diving". We believe the industry has gone down the wrong path by saying diving is for everyone. Not everyone is up for the action packed adventure diving can offer, but by watering down the adventure message to our core market now forces them to wrongly seek adventure elsewhere. Marketing 101: "When a brand tries to be everything to everyone, it has no position in the mind of the consumer". Our "Be unafRAID" call to action positions diving as an adventure sport. It challenges people to overcome their fears to discover what we know is the adventure of a lifetime. While we are not positioning diving in the same category as say BASE jumping, we do want our potential customers to see diving as an adventure sport. 2. Increasing base standards. We are not advocating "over the top" training standards, but rather extra time in water, more focus on bouncy control and simply producing more competent divers that are more likely to stay diving because they are very comfortable in the water. 3. An innovative continuing education program. We often hear how important continuing education is to our industry, yet frankly we feel continuing education is a "Con on Ed" and is failing. Ask your Regional RAID Office how our system increases continuing education. 4. They say that word of mouth is the best form of advertising. RAID will shortly release a new program that will help drive your word of mouth advertising to new levels. In fact, over the next year you will see many new and innovative programs released that will help grow your business. RAID Directors Paul Toomer and Barry Coleman are highly respected technical divers. While we recognise the primary focus for most stores must be recreational diving, we believe it is important to be on the cutting edge for all types of diving. RAID began as a rebreather training company. In fact, we developed the first "product specific" training program ever in the dive industry - developed for the Poseidon MK 6 by our Barry Coleman. RAID will continue to be leaders in rebreather training and other forms of more technical diving with many additional courses on the way. In terms of rebreathers we believe they have a real future in diving and we can help your store to take advantage of this growing opportunity like no other training agency. That is, we currently have a large range of technical courses online with many more planned over the next year. We will continue to innovate. Importantly, we have created a number of pathways from entry level all the way to instructor that either incorporate techniques adopted from technical training or start with non-traditional programs in the same way F1 racing has contributed to the automotive industry. For example, you can start your entry level training on a rebreather. We believe it is better to learn effective buoyancy techniques from technical training from the outset rather than trying to retrain later to be able to use more advanced equipment correctly. We are seeing some truly incredible results with this type of approach. With RAID diver academics being fully online, RAID has no books and no plastic, so we have minimal environmental impact on the world we love and therefore we directly contribute to and continually promote, the development and maintenance of a better planet.